MPs have overwhelmingly backed plans for a referendum on the UK's membership of the European Union. The vote, which followed the first debate on the EU Referendum Bill, means the legislation moves to the next stage of its progress through Parliament. Foreign Secretary Philip Hammond said a "generation" had been denied a say on the UK's place in Europe, and the public must now have the "final say". MPs voted by 544 to 53 in favour of the bill. The Conservatives and Labour support the bill, but the SNP opposes it. 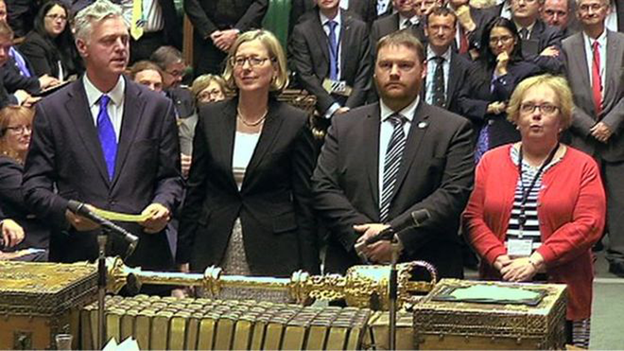 Earlier, MPs voted to reject an SNP amendment opposing the bill. The bill, which has now passed its second reading and will next be examined by a committee of MPs, has several more stages to pass through. Prime Minister David Cameron, who first promised a referendum in 2013, has pledged to negotiate a "better deal" for the UK in Europe in advance of the vote - to be held by the end of 2017 at the latest. Mr Hammond said a vote - which would be the first on the UK's links with Europe since 1975 - was needed to renew the democratic legitimacy of the UK's relationship with the 28-member body. "We've had referendums on Scottish devolution, referendums on Welsh devolution, referendums on our electoral system and on a regional assembly for the North East," he said. "But an entire generation of British voters has been denied the chance to have a say on our relationship with the European Union. And Mr Speaker, today we are putting that right." You don't need a doctorate in mathematics to work out this was a Commons majority of rather a lot. With 650 MPs in the House of Commons, persuading 84% of them to vote the same way is quite something. In fact, such an achievement the result was held up because of the length of the queue of those wanting to endorse the idea of an EU referendum. Labour campaigned before the general election against the idea of a referendum, saying it would be destabilising. But after what amounted, to them, to be a rather destabilising appointment with the electorate, they have changed their mind in defeat. For some, this vote is something they have campaigned on for as long as they have been at Westminster: a say for the people on our place inside or outside the European Union. For all of us, it is the start of a debate about how we see ourselves, our place in the world and a decision for us each to take, within the next two and a half years. 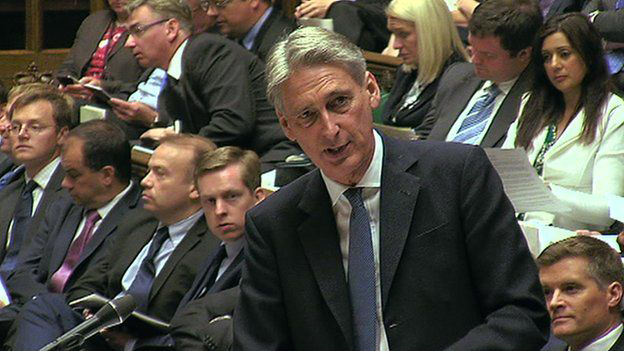 Mr Hammond added: "We need a fundamental change in the way the European Union operates. It is now a union which has at its core a eurozone of 19 members which will integrate more closely together. "There needs to be an explicit recognition those who are not part of that core do not need to pursue ever closer union. There need to be an explicit protection of the interests of those non-eurozone members as the EU goes forward. "We expect to be able to negotiate a new deal which will address the concerns of the British people which we will then put to them in the promised referendum." Labour opposed a referendum during the general election campaign but has since changed its mind, saying it will not oppose the bill, although it will seek to make a number of changes, including to the franchise. Sir Bill Cash said it was not in Germany's interest for the UK to be in "the second tier of a two-tier Europe"
Shadow foreign secretary Hilary Benn said the Labour leadership would campaign strongly in favour of the UK remaining a part of the EU, contrasting this clear position with what he said were the mixed signals from the government. "The prime minister is probably for in, but he can't say definitely he's in or out because a lot of his MPs are for out unless they can be persuaded to be in," he said. "Meanwhile, the foreign secretary who used to be leaning out now appears to be leaning in, while other members of the Cabinet who are for out read yesterday that they would be out unless they campaigned for in. "Now it seems they might be in even though after all they are probably for out. In, out, in, out, it's the EU Tory Hokey Cokey - a complete mess." Former SNP leader Alex Salmond, who tabled the SNP amendment opposing the bill, said "no-one believed" David Cameron wanted to take the UK out of the EU and suggested the bill was primarily designed to appease Tory backbenchers. "This bill is based on a nonsense and a contradiction. Major constitutional referendums should be held on a proposition, honestly held. "The prime minister proposes to hold this referendum as a political tactic... and that is why there is so much suspicion already, not just among opponents of Europe but among those who are proponents of Europe." The SNP's Angus Macneil has insisted he did not vote by mistake for the EU referendum bill despite ending up in the wrong lobby. During the second vote, the Western Isles MP entered the Yes lobby where supporters of a referendum had gathered. But he said he exited without voting once realising his error. During a six hour debate, former Chancellor Ken Clarke, one of the most pro-European voices in the Conservative Party, warned that the UK would be marginalised if it left the EU, potentially facing tariffs on imports and exports. "This is about Britain's role in the modern world, the 21st century world of inter-dependent nations and how we maximise our influence by using our power base in Europe. The alternative is a fanciful, escapist route into isolated nationalism which I think will greatly diminish our influence in the world and damage our economy." But he was challenged by former Environment Secretary Owen Paterson, who said he was misrepresenting the views of eurosceptics. "He really must not muddle the idea of the European Union, which is a political and judicial institution and the European market, which I am a most enthusiastic proponent of." 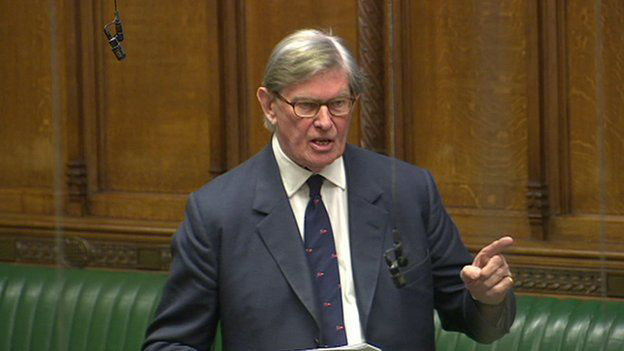 And veteran Conservative Sir Bill Cash said the referendum was a fundamental question of "who governs Britain". "We have a positive alternative to the EU," he said. Our democracy and our national Parliament is what people fought and died for in two world wars and it was through this sacrifice that we saved Europe." Both eurosceptics and pro-European MPs have raised concerns about government plans to scrap the 28-day "purdah" period in the run-up to the referendum. Purdah usually prevents any government or civil service activity that may influence the result of an election or other vote. Mr Clarke said he understood concerns that a purdah period would "close down half the government's business" but said he hoped the machinery of government was not used to give one side "an unfair advantage". Mr Paterson said the decision to lift the purdah rules was "unilateral and arbitrary" and if the British government and the European Commission sought to "deluge the public with information", people may not accept the final result.